Good news for the IRA! The Wall Street Journal recently issued a report that more than 40 percent of police officers, firefighters, and security officers are obese. 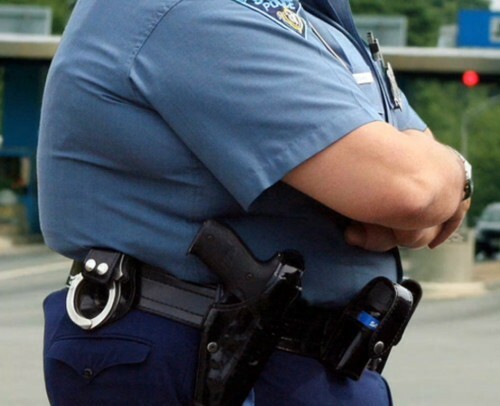 An FBI study found that eight-out-of-10 police officers are overweight. In fact, police officers, firefighters and security guards have the highest rates of obesity of all professions, according to data from the American Journal of Preventive Medicine. Looks like we need to build our own arsenals if our professional protectors can’t run and tackle the bad guys. Is that why we are shooting first? For the IRA the latest obesity stats might be the ammunition- a veritable shot in the arm- to convince us that we need to own a gun- or several. Did you know that American gun owning households have declined from a high in 1978 of 51% to the current 32%. Before you run out to buy a gun, think about if the bad guys are fat then they can’t run either. One cancels out the other! It is different for firefighters, they have to climb ladders and carry down bodies to safety regardless of the sizes. Not all however; the case of the 800lb woman who couldn’t fit through her door was solved when the fire department ripped out her window and used a giant crane to haul her down. The obesity problem extends to our Military. In the past, an Army spokesperson said that drill sergeants could run extra weight off new recruits, but now, there are people trying to enlist who are more than 50 pounds overweight. The pool from which the military may draw upon for recruits is nearly 30% smaller due to obesity. Fortunately, we are downsizing our armed forces just in time. Although we have the most expensive and largest Military in the world — bigger than the next seven countries combined — President Trump says we need to spend more money. Since we won’t be hiring real people, we can spend on more robots and equipment. Good news is that their repairs are easier than with human ones.